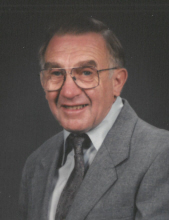 Lester Otto Griepentrog of Hartford, Wisconsin died Saturday, October 20, 2018 at home at the age of 91 after a courageous battle with Parkinson’s disease. He was born August 30, 1927 in the Town of Wayne, WI to the late Vinelda (nee Boettcher) and Oscar Grieptentrog. Before his marriage he rented a farm near Barton and hauled milk for Kohlsville Cheese Factory. He was united in marriage to Rosemarie Beine at Holy Angels Church in West Bend on May 25, 1957. He was a Dairy Herd Improvement Association milk tester for Washington County for 3 years. In 1960 Lester and Rosemarie settled on a farm in Nenno in Dodge County for 29 years. Lester served on the Dodge County DHIA Board of Directors for 6 years. He was a member of the Holstein Association. He excelled in his dairy herd raising purebred cattle. Lester and Rosie also hosted the Dodge County Twilight Meeting in 1984. In 1989 they moved to their retirement home in the Town of Addison. He continued to help out farmers for another 13 years. He and Rosie enjoyed traveling on bus tours, playing sheepshead, gardening, and playing games with grandchildren and great-grandchildren. Lester leaves behind his wife of 61 years, Rosemarie; daughters, Marge Griepentrog of Westmont, IL and Sharon (Jerry) Groth of Rubicon; brother, Milton Griepentrog of Fitchburg and sisters, Shirley (Lee) Frazier of Fitchburg, Carol (Merlin) Volm of the Town of Wayne, and Ruth Sauer of Sun Prairie; sister-in-law, Jayne Griepentrog of Oconomowoc; grandchildren, Tyler Groth, Cassandra (Dean) Buttke, MyKalia (Randy) Doll, Samantha (Mike) Freitag; great-grandchildren, Cheyenne and Austin Freitag. He is also survived by many nieces, nephews, friends, and neighbors. He was preceded in death by his son, Alan Joseph Griepentrog; parents, Oscar and Vinelda Griepentrog, brother, Arland Griepentrog and infant brother, Lloyd Griepentrog; parents-in-law, Joseph and Marie Beine; brothers-in-law, Roman Sauer, Gilbert (Hyacinth) Beine, and Phillip Beine; and infant sister-in-law, Viola Beine. Lester’s family wish to extend their sincere gratitude to the following neighbors and their families for their caring support: Jim Gutjahr, Paul Steinbach, August Hau, Dan Henneberry, Matt Fisher, and Toby Becker. In lieu of flowers, memorial contributions to a charity of one’s choice in Lester’s memory are appreciated. To send flowers or a remembrance gift to the family of Lester O. Griepentrog, please visit our Tribute Store. "Email Address" would like to share the life celebration of Lester O. Griepentrog. Click on the "link" to go to share a favorite memory or leave a condolence message for the family.